Named by Time.com's @Techland as one of the best weather apps for your iPhone and Apple Watch. Severe weather alerts for your exact location. Storm Shield gives you storm-based alerts for tornado, hurricane, flood, thunderstorm, winter storms and other life-threatening weather events via voice and push notification. Storm-based alerts help reduce false alarms by alerting you to severe weather based on your exact location within a county. County-based alerts can result in false alarms, warning you when your location in the county is not within the threatened area. 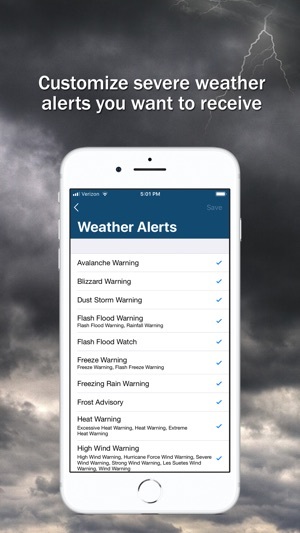 • Get voice alerts just like a NOAA weather radio via push notification anywhere in the United States. • With Apple Watch, get a tap on your wrist when alerts are issued for your locations. 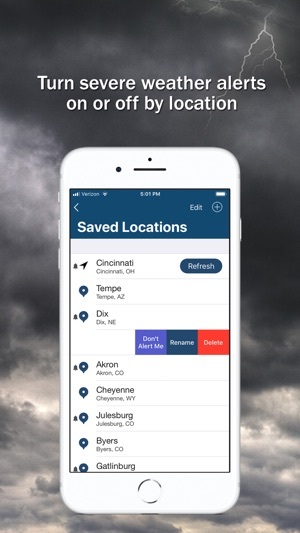 • Add Storm Shield's widget to your Today screen to get quick access to active alerts for the first location in your app. • Touch Storm Shield's app icon on your 3D-Touch enabled iPhone for quick widget access. 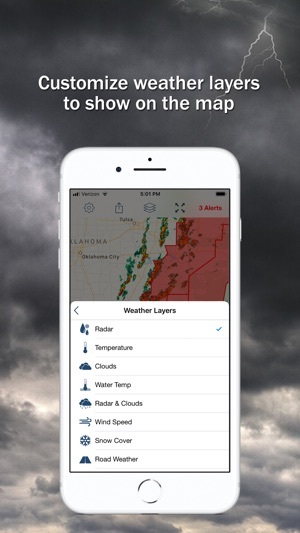 • Hi-Def radar map is your home screen so you can quickly see what's going on at your locations. • Long-tap on the map to get current conditions, hourly and daily forecasts. • Save additional locations to ensure family members stay safe. • Closings for Baltimore, Buffalo, Cincinnati, Cleveland, Denver, Detroit, Green Bay, Indianapolis, Kansas City, Lansing, Milwaukee, Nashville, Omaha, Tulsa. 1) Lightning strike push notifications up to 10 miles away. 2) See lightning on the map within 150 miles of a selected location. Storm Shield is made possible by The E.W. Scripps Company & KMGH Denver, WXYZ Detroit, WCPO Cincinnati, WEWS Cleveland, RTV6 Indianapolis, KSHB Kansas City, WTVF Nashville, KMTV Omaha, KJRH Tulsa, KTTS Springfield, KFDI Wichita, WFTS Tampa, WPTV West Palm Beach, WFTX Ft. Myers, WTMJ Milwaukee, WGBA Green Bay, WSYM Lansing-Jackson, WMAR Baltimore, WKBW Buffalo, KNXV Phoenix, KGUN Tucson, KTNV Las Vegas, KGTV San Diego, KERO Bakersfield, KIVI Boise. • We fixed a bug on iPad where the map didn't properly display across the entire screen when iPad was in Landscape View. As a result of this fix, we've expanded the Location Card view (at the bottom of the map screen) to be more helpful and show more hours when iPad is in Landscape view. • We fixed another bug where the Hurricane Tracks detail screen could not be closed if it displayed a lot of hurricane track data points. • We fixed a small bug where the app would crash when attempting to Share a map image to the device's Camera Roll. • We fixed a small bug that caused the app's Notifications permission box to not display correctly when the user wanted to enable Weather Alerts in the app, but the iOS device itself had notifications disabled (in iOS Settings). • Additional under-the-hood maintenance items are included in this release. To be clear, you are not being charged a monthly fee for features you had previously. In fact, NO features from the old version 3 app were moved to a monthly fee. In this version 4 release, two NEW features, Future Weather (which unlocks Future Radar, Storm Tracks, Future Temperature Map) and Lightning Strikes (which unlocks Lightning Notifications and Lightning strikes on the map), are NEW additions to the app, and are subscription-based and optional. These features did not exist in the old version 3 app. With your download of Storm Shield App version 4, the features that were in the previous version 3 app are still available at no additional charge. 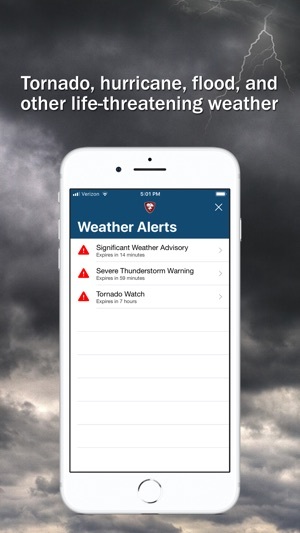 You can: get severe weather alerts, view alerts on the radar map, view details of active alerts, save multiple locations, view current conditions, view hourly and daily forecasts, view local TV station content (if a local media provider exists in your market). Also, there are several NEW features you get for FREE that were not available in the old version 3 app: view Clouds and Radar together on the map; Wind Speed; Snow Cover; Temperature Map; Water Temperature Map; Road Weather; Earthquakes; and the ability to view multiple severe weather layers on the map at the same time (which version 3 could not do). If you have other concerns or something isn't performing as you expect, please provide more detail by filing a Support ticket from within your Storm Shield App, which provides us with additional diagnostic data, and we’ll be happy to look into it. This is an update from my last review. If you know where to look, the features I liked about previous versions are still there. So I up-rated my review to 4 stars. The problem is that finding the forecast stuff isn’t straightforward in this version. In this version there is a fairly large button with the options “Current” and “Future”. Click on Future and basically what you get is a “Pay Up” message. To get the old forecast features, click on the little, tiny “More” in the bottom right, up comes a screen with current data plus sunrise/sunset. There is nothing to indicate that scrolling down will get you the forecast for the week that you were looking for. No slide bar shows until you actually start scrolling. Great app but it’s really not free. With the last update it will only show you what’s happening right now. I can open the door for that. To get any forecast data (i.e., what’s going to happen), you have to buy a subscription. And it’s not clear that will even get you an ad free experience. 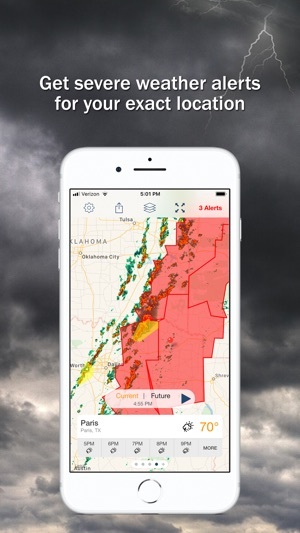 The features that were in the previous version of the app are still here at no additional charge, which include severe weather alerting for your current and saved locations, ability to view current conditions, daily and hourly forecasts for each of your locations, and view radar and alert polygons on the map. In addition, there are several NEW features you get for FREE that were not available in the old app: view Clouds and Radar together on the map; Wind Speed; Snow Cover; Temperature Map; Water Temperature Map; Road Weather; Earthquakes; and the ability to view multiple severe weather layers on the map at the same time. Also, two NEW optional paid features, Future Weather (which unlocks Future Radar, Storm Tracks, Future Temperature Map) and Lightning Strikes (which unlocks Lightning Notifications and Lightning strikes on the map), are NEW additions to the app. These are subscription-based and optional. If you feel there is something missing that was in the previous version and is not free in this version, please let us know by filing a Support ticket from within your Storm Shield App and we’ll be happy to look into it. I’ve read a lot of reviews that have the same complaint I’m about to make, and I’ve also read the developer responses to the reviews. I previously paid for this app years ago. And I get that the new version has all the same features as the previous version plus a few extra features. But the new features that require an additional monthly subscription, I don’t think it’s something that you should even be asking for an additional monthly charge for. Just have one flat fee of a few bucks to either upgrade to those features or raise the price of the initial cost of the app by a buck or two. I think the monthly charge to see future radar and lightning strikes is ridiculous. I would love to see future radar (could care less about lightning strikes), but I’m not paying .99 a month for it and I don’t think it’s fair to charge a monthly fee to see that. It doesn’t seem worth $12 a year, but I really would love to just have that feature if I could pay a couple dollars to add it if it’s that important to make a profit off of the future radar feature (lame). Otherwise I enjoy the app. Just think the extra subscription is ridiculous. Thank you for letting us know how you feel about the optional monthly subscriptions, and that you enjoy the app.